Which are more important: first thoughts or last words? It’s a question opera lovers pore over with glee in regards to many of the art form’s greatest masters who have reworked previous pieces, and it’s a question that figures prominently in perhaps the other big ambitious project of this year’s Santa Fe Opera season, a production of Rossini’s opera seria, Maometto II. The work, originally written in 1820 for Naples and then subsequently revised for Venice and then completely reworked later for Paris as The Siege of Corinth has recently become available in a new critical edition that will be published next year. Santa Fe Opera and music director Frédéric Chaslin have had the good fortune to present the world premiere performances of this new edition with another major opera star this summer, Luca Pisaroni, in the title role. Pisaroni was reportedly keen to take on the role as had one of his idols Samuel Ramey many decades earlier, and when the stars aligned, he and the company got their wish. Audiences seem to be getting their wish as well with a show that has some exciting singing, even if it isn’t always in the most expected places. Pisaroni plays Maometto II, the Turkish sultan laying siege to the Venetian colony of Negroponte. He gets to do fun, crazy things here in David Alden’s sometimes grandiose staging, including climbing aboard a chariot pulled by a statue of three giant size black steeds that descends from an angle at the back of the stage. He sounds great, and makes more of the fine vocal detail than most baritones typically do. He’s paired with one of the more surprising names in the cast, Leah Crocetto, a former Adler Fellow in San Francisco, who takes on Anna, Maometto’s love and daughter of his enemy. Crocetto has a lovely, sunny, and strong instrument, but I would never have thought of her as a bel canto singer. And at first I felt my suspicions were confirmed when she entered with significant hesitation on Friday night. But something clicked and soon she was pulling out coloratura detail around every bend with real agility and some beautiful phrasing throughout key moments in the close of Act I and the major duet with Maometto that opens Act II. She was a singer to watch even before, but what other surprises she has up her sleeve may be anyone’s guess at this point. Bruce Sledge played Anna’s father Paolo Erisso and was robust and flexible. Meanwhile mezzo Patricia Bardon, a favorite of mine, seemed to be having an off night vocally on many fronts as Anna’s secret husband Calbo. She struggled at times with the detailed passage work and pitch was a problem in the upper register. But luckily all of the cast had excellent support from the orchestra, and Chaslin again proved he’s got the chops to do exactly what a music director must, master a variety of basic repertory styles with certainty. His conducting of the bel canto score was fleet, bordering on breezy at times, avoiding the melodramatic and providing consistent support to the carefully phrased vocal lines throughout. If there was hesitancy in the show, it was most likely in David Alden’s sometimes timid staging. Alden has a long history in Santa Fe and is no stranger to colorful, nearly hallucinogenic moments on stage particularly in the world of Baroque operas. And he does deliver some here amid an oddly sloped set of curved walls and stairs that don’t always lead anywhere. But there are just as many moments filled with a cast that seems uncertain where to turn amid the odd angles. The chorus and extras in particular are given strained, sloppy looking choreography to manage with the kind of sword and spear play one associates with a rerun of Kung Fu. All of this looks funny exactly when in shouldn’t and cuts into the forceful menace of a piece about two peoples at war. Does the new edition make a difference? Maybe. But after hearing what is supposedly a closer version to Rossini’s first thoughts on the piece, it’s also quite easy to see why he would have revised it. Anna and Maometto’s final scene still seems awkward and confusing, and the motivation for her eventual suicide come off as unclear. The opera almost seems to crash into itself in the last twenty minutes or so. Still if opera is a sport, this is one fun game to watch unfold with surprises and a few disappointments that make loving this art form particularly worthwhile. 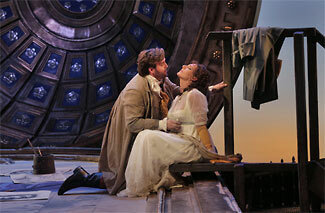 Meanwhile, Santa Fe Opera’s popular favorite on this summer’s program roster is a new production of Puccini’s Tosca. It’s an opera that provides particular challenges for the company’s gorgeous outdoor theater that lends itself easily to dramatic elemental moments. This verisimo gem with its very particular interior spaces and the ugly business that occurs there calls out for something a bit more cloistered. But director Stephen Barlow, has met the challenge with an almost M.C Escher inspired approach with principals cavorting through a set filled with painting, forced perspective, and angular lines that amp up the surrealism. In Act I Cavaradossi, and indeed the entire cast, traipse back and forth across the painting he is working on that covers the floor of the stage. Meanwhile the detached dome of Sant’Andrea della Valle hangs detached above like the setting sun on the New Mexico skyline. It’s attractive imagery but infuriatingly distracting with its oddity. The painting disappears, but the large set piece persists, rising up to reveal the wall of Scarpia’s quarters in Act II and serving as the floor of the tower at the Castle Sant’Angelo in Act III. There are turret walls that appear by this point, but it’s never really clear where Tosca is going to jump from until low and behold she does. It doesn’t make it more shocking, just more perplexing. 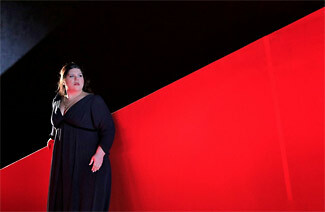 Amanda Echalaz sings the title role here in her U.S. debut. She has the power and can be steely at times in the part, but she also tends toward the brighter side, tone wise, losing some of the darker qualities in the vocal part. 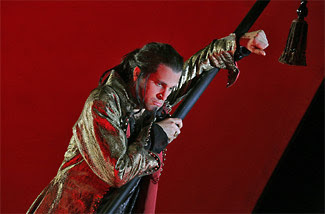 Raymond Aceto, who is sharing the role of Scarpia with Thomas Hampson who will take over in August, was a reasonable and menacing villain without overplaying his hand. But the big story here vocally was tenor Brian Jagde who took over the role of Cavaradossi for the entire run just days before the opening of the season with the withdrawal of Andrew Richards. Jagde has a relaxed athletic tone that never feels pinched. And while the chemistry between Echalaz and him fizzles at times, he’s both believable and the kind of young singer you instantly want to hear more from. Music director Chaslin is in the pit again here and again gives this most severe of Italian shockers a lighter, more focused approach than some might have chosen. But it worked quite well keeping the show concise and focused right through to the finish. If Tosca is Santa Fe’s opera staple on this year’s menu, they’ve put together a show that shouldn’t disappoint those looking for comfort food.